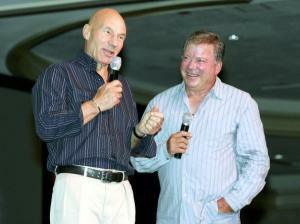 William Shatner Wants to Make A Documentary on ‘Star Trek: The Next Generation’!!! William Shatner just posted to his social media outlets, “Hoping to do a documentary on Star Trek:The Next Generation. I don’t know if you know but there’s a mysterious story that needs to be told and I’d like to tell it.” This blew my mind. I wonder what kind of mysterious events surround the epic series. And what will Shatner bring to it. We are trying to get some more information on this project, but this might be the best thing since sliced tribbles. Your thoughts? The first seaon of The Next Generation comes out on bluray on July 24th. ‘Star Trek’ Series Comes Back To CBS With Wil Wheaton?!?! This entry was posted on Friday, June 29th, 2012 at 1:40 pm	and is filed under Film, News. You can follow any responses to this entry through the RSS 2.0 feed. You can skip to the end and leave a response. Pinging is currently not allowed. « HBO and Cinemax Bring Three Shows to Comic-Con 2012!! !